You are here: Home / Sellers / FSBO or Realtor? Which one? When selling your home, should you go For Sale By Owner or should you hire a Realtor? As a homeowner, you do know your house better than anyone else, but knowing your home and selling it are two different scenarios. 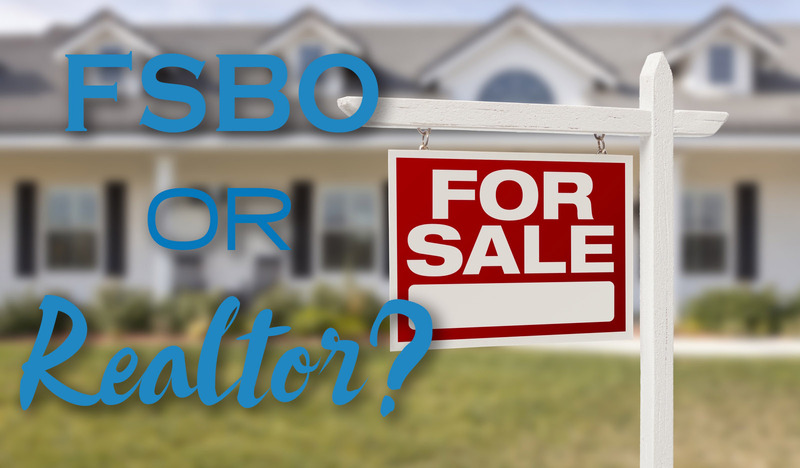 Here are some examples why hiring a Realtor is a better option than FSBO. When listing with a Realtor, the average sales price is higher than selling it under For Sale By Owner. According to the National Association of Realtors Profile of Home Buyers and Sellers, the median FSBO home sold for $210,000 compared to $249,000 among agent-assisted homes in 2015. It’s more than a handshake when it comes to selling your home. There’s lots of paperwork, disclosures, and contracts to go through to make sure there are no future legal problems. A Realtor has gone through the selling process multiple times, so they understand the paperwork inside and out. They will make sure nothing is skipped over and that the process goes smoothly. If you choose to sell your home as a FSBO, that means you’re in charge of every little thing, including showing your home to potential buyers. A Realtor can coordinate when to show your home, even when you’re not around, and they’ll make sure it’s safe to show to homebuyers by screening them beforehand. Realtors are marketing experts, and they know what needs to be done to change the ‘for sale’ sign in your yard to ‘sold’. They can tell you how to stage your home, what needs to be cleaned or rearranged, or how to make the rooms look more open. Our Realtors also have access to an in-house photographer who will take high-quality photos of your home to better market the listing online. Now if you don’t go with a Realtor you can save some money on commission, but there’s the risk of making less money from the sale or running into potential legal problems. You would have to rely on your own skill to complete the paperwork. According to an article from Realtor.com titled “Why For-Sale-by-Owner Sales Fail,” about 90% of homeowners would much rather work with a professional than have a possible inadequate sales experience. As Stovall Realtors, we’ll help sell your home, serve you to the best of our abilities, and make sure the selling process is a smooth one. It’s interesting that a for sale by owner home will actually sell for less than an agent assisted home would. It makes sense that since a lot of buyers are utilizing the help of real estate agents, having your own to contact them could fetch a higher price. Thanks for the post; these tips could be very helpful when looking to sell my home because I want to make sure I sell it for what it’s worth and that it’s sold quickly to make the moving process just that much smoother. Thank you so much for your comment! It’s amazing how much a Realtor can help sell a home. If you have any more questions feel free to email us or call us at 325.691.1410.